Happy Summer Solstice folks! Summer officially arrives on Monday June 20th this year, but we’ve been enjoying the fruits of the season for a few weeks now! Sweet salad mix, baby spicy salad mix, baby arugula, bell peppers, yellow seasoning peppers, hot peppers, garlic chives, Italian basil, Thai basil, lemongrass, recao, plenty of sweet potatoes with bright red skin and orange flesh, small pumpkins, sweet papayas, passionfruit, melons, lots of pineapples, lots of dragonfruit, and from our partners we will have the perfect pairing: creamy, mild Fiddlewood Farm goat cheese, and three types of sweet, fruity mangoes from Tropical Exotics​! Whisk the vinegar and oil together with the salt. Toss with the lettuce and onion to coat lightly. 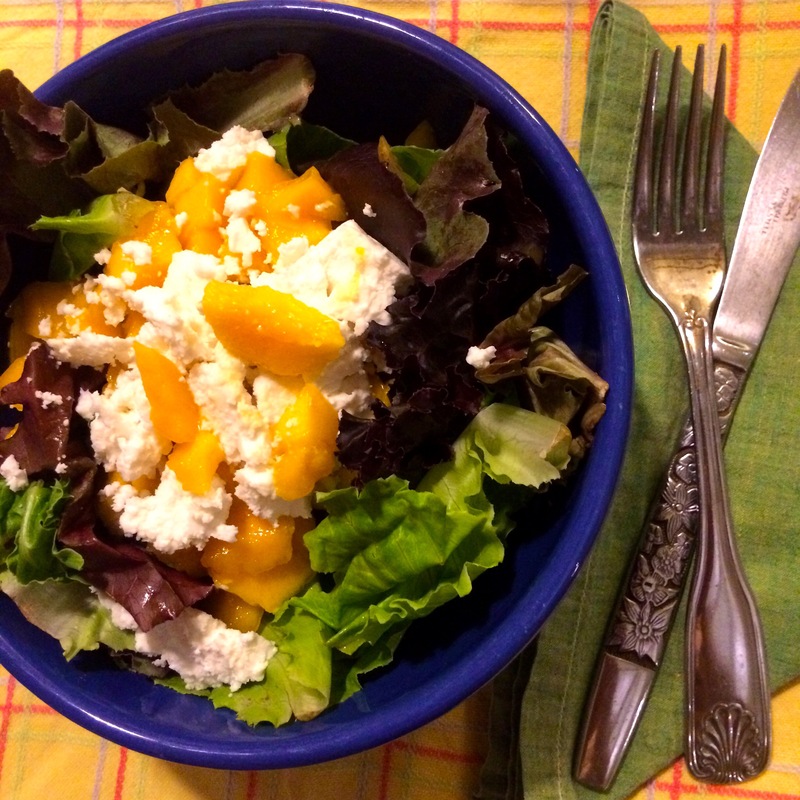 Arrange the mango and goat cheese artfully on top of the salad. Sprinkle a handful of lightly toasted pinenuts or sunflower seeds over the top to make it really over the top. Present to the sounds of Ooohs and Ahhhhs, then toss before serving.